ZyXEL Dimension GS-2024, a Managed Layer 2 Wired speed Gigabit performance switch, is a cost effective Gigabit connectivity solution for the SMB and Enterprise LAN market. 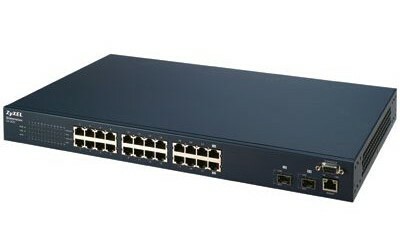 With non-blocking 48 Gbps switching fabric, the GS-2024 provides 24-port 1000Base-T Layer 2 switching capability at wire-speed over current CAT-5 cabling to the desktops, as well as two open SFP slots providing fiber connectivity for long loop reach applications. The highly effective switch architecture of ZyXEL GS-2024 offers 48Gbps non-blocking switch fabric, 35.7 million packet-per-second forwarding rate and wire-speed performance. Ten times bandwidth than traditional Fast Ethernet that offer a hardly wait network experience which is suitable for Today's diverse E-Business applications. These benefits allow customers to enjoy exceptional network speed with little effort. 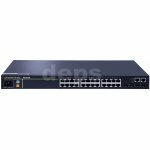 ZyXEL GS-2024 features a comprehensive set of network management interface, including Web-based management interface, CLI management interface (Local/Remoter) and a built-in out-of-band MGMT RJ-45 port. User can easily configure, troubleshoot and monitor switches through these methods. The GS-2024 also supports ZyXEL iStacking™, a superior Web-based management software that allows administrators to remotely manage multiple switches located differently. Administrators can configure, monitor, troubleshoot and manage up to 24 switches at once with just one IP, regardless of the physical locations. With all ports support N-way auto negotiation and MDI/MDI-X crossover, the GS-2024 supports 802.1p priority queue, 802.1Q VLAN, port-based VLAN, 802.3ad port aggregation, 802.1w RSTP and rate limiting. Corporate IT users can also benefit from the QoS and Security features of ZyXEL GS-2024. For traffic management, the GS-2024 supports IEEE 802.1p that classifies and prioritizes network traffic by four independent queues. On security, the GS-2024 supports Specific MAC Addresses Forwarding Per Port, which means only designated subscribers has the privilege to pass through the specific ports. In addition, the GS-2024 also supports IEEE802.1x port authentication.